SHORT-TERM investments made by foreign investors to the Philippines turned positive in November this year, indicating a resurgence of favorable global investor sentiment toward the country for the coming months. Bangko Sentral ng Pilipinas (BSP) Governor Nestor A. Espenilla Jr. said the country’s outstanding external debt went up by 5.6 percent or $4 billion to $76.4 billion as of end-September this year from $72.4 billion in the same period in 2017 with new borrowings during the quarter period. Nomura Securities Ltd. expects the Philippines to book faster economic expansion with gross domestic product (GDP) growing above seven percent next year amid the election-related spending boost. The amount of money millions of overseas Filipino workers (OFWs) are sending home to their families is increasing and has reached more than $21 billion (more than P1 trillion), the lone representative of OFWs in Congress said yesterday. One of the world’s largest steel makers from China, HBIS Group Co. Ltd. is set to invest $4.4 billion to build an integrated steel complex in Mindanao. The Board of Investments (BOI) said the Philippines hopes to attract more investments in the assembly of vehicles and appliances with the entry of China’s HBIS Group Co.Ltd., the largest industrial investment in the country. The solon who questioned Budget Secretary Benjamin Diokno for insertions in the 2019 budget said at least ₱550 million worth of infrastructure projects were found to have links to the Cabinet official’s in-laws. The Board of Investments (BOI is poised to end the year with about P850 billion worth of commitments based on the pipeline projects expected to be approved in the remainder of the year. Projects approved by the Board of Investments are expected to hit an all-time high of P792 billion by year-end, surpassing the 2018 target of P680 billion, according to Trade Secretary Ramon Lopez. House Majority Leader Rolando Andaya Jr. (Camarines Sur) said in a press statement on Sunday that he has received information that a former member of the Duterte Cabinet was allegedly involved in “parking” at least P300 million in infrastructure projects. House Majority Leader and Camarines Sur Rep. Rolando Andaya Jr. on Sunday said a former Cabinet official seeking an elective post has allegedly parked at least P300 million in infrastructure projects in the national budget. In the Philippines, the life expectancy of mayors and their deputies can be very short. A recent spate of public assassinations of local officials in broad daylight brought the spotlight back on political killings in the country, now dubbed the “murder capital of Asia” by opposition senator Antonio Trillanes. THE European Union (EU) on Thursday contributed €21 million (about P1.26 billion) in grants that will bankroll clean energy projects in the regions estimated to provide power to thousands of households. The enactment of the Personal Property Security Act (PPSA) into law will improve the access of micro, small and medium enterprises (MSMEs) to bank credit, and give way to the Duterte administration’s goal of expanding financial inclusion, the Department of Finance (DOF) said. THE US Department of Agriculture does not expect significant growth in the volume of rice imports in Markey Year (MY) 2018-2019 even with the passage of the rice tariffication bill. SENATE leaders thumbed down renewed efforts to railroad proposed Charter changes, embodied in Resolution of Both Houses (RBH 15) approved by the House of Representatives on third and final reading before adjourning on December 13. THE HOUSE of Representatives approved on second reading the bill increasing the service charge benefits of rank-and-file employees in the hospitality industry. “Working people and their families are bearing the brunt of President Duterte’s divisive politics. Extending Martial Law in Mindanao gives the green light to further militarisation of workplaces and entire communities. THE ALLEGED parked funds for flood mitigation projects will be up for scrutiny by the House rules committee, Majority Leader Rolando G. Andaya, Jr. said. The additional revenue to be generated by two House-approved bills that seek to increase tobacco and alcohol excise taxes may not be enough to bridge the P40-billion funding gap for the government’s universal health care (UHC) program, the Department of Finance (DOF) said. Filipino consumers’ pockets will be freed up of roughly P18 billion worth of annual power cost subsidies with the plan of the Department of Energy (DOE) to phase out the universal charge for missionary electrification (UCME) line item in the electric bills. A tender is an offer to buy out the public’s holdings, whether common shares or non-voting preferred shares, sold to them by listed companies. Two years ago, Ryan Rillera was the branch manager of a well-known fast food joint. Although the salary was adequate, his work took him away from his family. The Department of Agriculture is extending P130 million in loan funds for livestock and poultry raisers in Davao City for the establishment of facilities to ensure growth of the sectors in the region. Puwersa ng Bayaning Atleta (PBA) Party-list Rep. Jericho “Koko” Nograles on Sunday sounded an alarm over the supposed “swinging” operation at the Mindanao International Container Terminal Services Inc. (MICT) at the Phividec Industrial Estate complex. Twenty-one groups expressed interest in the latest Philippine Conventional Energy Contracting Program to develop indigenous sources of energy, a government official said. RATES of Treasury bills (T-bill) on offer today are expected to move sideways amid steady demand following the decision of the central bank to keep key interest rates steady. The peso is expected to further lose ground next year, settling at 55 against the dollar by end-2019 due to a widening current account deficit, said London-based Capital Economics. People flocked to the Balangiga Church in the Philippines as one of the three historic bells tolled for the first time in 117 years on Sunday. State-owned Development Bank of the Philippines (DBP) released P1.6 billion worth of loans to Camarines Sur for infrastructure, public facilities and social services projects. A report that some members of the Catholic clergy were asked by a Presidential Management Staff (PMS) member to leave the Balangiga bells turnover before President Rodrigo Duterte’s arrival is already being probed, Malacañang said Sunday. Theresae, a new edaphic-endemic species in Dinagat and Mindanao Islands, was named after Dr Theresa Mundita S Lim, the executive director of the Asean Centre for Biodiversity and former director of the Philippines’ Department of Environment and Natural Resources Biodiversity Management Bureau (DENR-BMB). The Bureau of Internal Revenue (BIR) said taxpayers must pay taxes they themselves declared, or face tax fraud charges. The Philippine creative economy sector has received a big ‘shot in the arm’ following the signing of a three-year multisectoral partnership between the British Council, the National Commission for Culture and Arts (NCCA), the Board of Investments (BOI) and the Creative Economy Council of the Philippines (CECP) to promote Filipino creativity and unique culture. 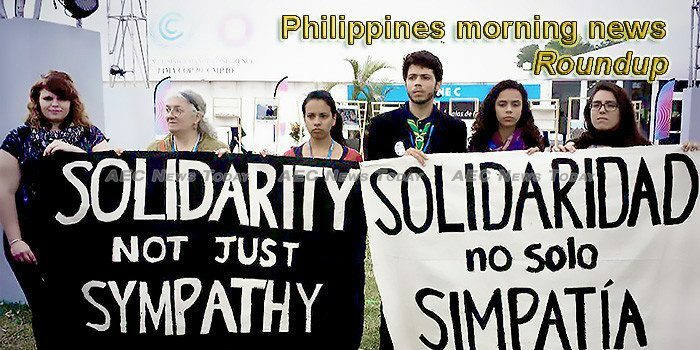 This week’s Philippines morning news feature photo acknowledges International Human Solidarity Day, December 20.